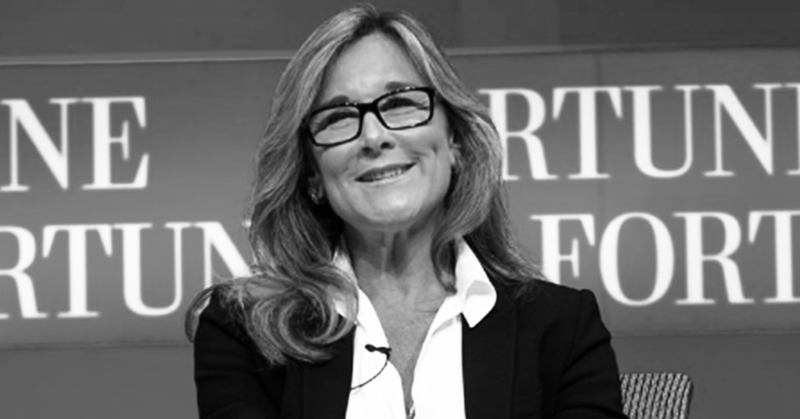 Angela Ahrendts’s morning routine may not be what you’d expect from the Senior Vice President of Retail and Online Sales for Apple worldwide, let alone someone who spent most of her career before that in the fashion industry. Ahrendts rises before 5 a.m. not to work or swim laps. Instead, she spends a half hour watching the sunrise, and rereading parts of the Bible, or favorite writers like Maya Angelou. 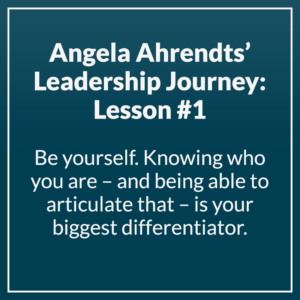 Without this time for spiritual reflection, she has repeatedly said, she would not be the leader she is today. Staying grounded in her spiritual side has served her phenomenally well. Ahrendts is not only the first woman on Apple CEO Tim Cook’s executive team but the first person at Apple to be charged with the big job of reconciling the digital shopping experience with the bricks-and-mortar one. It’s a highly coveted job won largely on the strength of her success stewarding Burberry from 2006 to 2014. Ahrendts rehabbed the classic Burberry brand, which had suffered due to excessive licensing deals and poor global coordination, and along the way embodied a personal brand entirely of her own making: that of the wholesome Midwesterner equally at home in small-town U.S.A. and the front rows of Fashion Week. Nearly every article on Ahrendts’ career mentions her open embrace of her roots. She grew up in New Palestine, Indiana (population 2091) in a family of six kids. She talks often of her parents and how they taught her to always be sensitive to other people’s needs and feelings. After graduating from Ball State University in Muncie, she booked a one-way ticket to New York with dreams of making good on her childhood dreams of working in fashion. Then after a 17-year long-distance relationship, she married her childhood sweetheart. Interviewed during her tenure at Burberry, she spoke about how remembering who she is at core—and what’s really important to her—helps her say “no” to everything unaligned with her core purpose. “I’ve never gone to the Oscars because I can’t afford another week away. It’s not more important than my husband. It is not more important than my kids. It is not more important than Burberry right now.” Besides, she added, being hailed as a great corporate leader “without being a great mom and great wife” didn’t interest her. 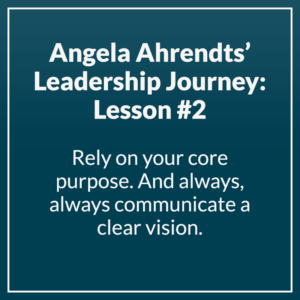 Remembering her core values also helps Ahrendts resist becoming distracted by counterproductive pressure to be all things to all people. At Burberry, this clarity meant returning the company to its own roots as a fashion and technology innovator, as well as a shift that seems cosmetic but speaks to a deeper intuition: a costly push to buy back licenses that had placed the brand’s famous check on too many products at too many price points. (It now appears on a mere 10% of Burberry offerings.) Less visible but more dramatic was her upending of conventional wisdom about enhancing the customer experience. In 2010 she was invited to give the commencement address at Ball State University. Her talk assured students that though they were graduating into a shaky economy, perhaps daunted by the scale of global competition or the “digital tsunami,” the rapid pace of change today, they possibly already possessed the foundation for future success: their core purpose and values that offered peace and confidence in times of ambiguity and flux. Having a strong intuitive sense of what you were put on this earth to do was “game-changing,” she said. Being able to return home and share this basic message of hope and inspiration—plus the party afterward thrown by friends, husband and kids—may have been “the best night of her life, she later told The Wall Street Journal. Better than meeting the Queen, the reporter asked? Absolutely, Ahrendts said. Speaking to the importance of heart and faith amid a culture so wired for quick fixes and sound bites was an honour. Dr. Robert Rosen is founder and CEO of Healthy Companies and author of Conscious: The Power of Awareness in Business and Life. At Healthy Companies, we believe that growth and success lie at the intersection of the personal and the business dimensions of organizational life. Our mission is to help CEO’s and executive teams build healthy, high performing companies through our consulting services, executive coaching and learning solutions. 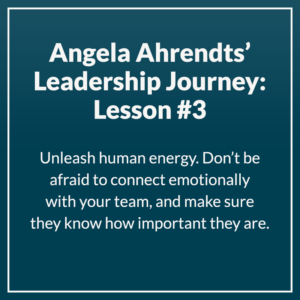 *Original article published in Developing Leaders Quarterly issue: 18:2015 titled The Psychology of Managing Trust. Read more at http://iedp.com/.